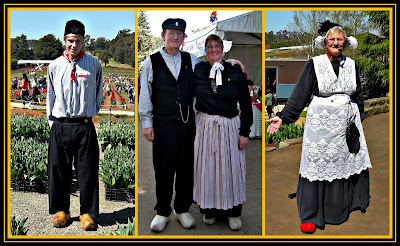 Dutch clothing and costumes originated in the country now called the Netherlands, which has 14 provinces, and each province has its own traditional costumes. The most well-known type of dress, considered the national costume, came from the southern province of Volendam and is still wore by Dutch women for the tourists. In all but one province, Dutch ladies wore some type of head covering made of either lace or stiff fabric. Some of them wore small lacy caps, a few had long lace coverings that came down passed their shoulders, while others wore the larger white-peaked ones. Some caps tied under the chin and some did not. The men also wore hats, though mostly when outdoors; some had wide-brimmed hats while others sported a traditional fisherman’s hat or flat cap. Children’s apparel mirrored the adult clothing. The upper part of the women’s clothing consisted of at least two layers. The first layer always had sleeves—cap sleeves, elbow-length sleeves or wrist-length sleeves—usually a dark color, but sometimes this bottom garment was white with the outer tier having color. The outer tier of most dresses attached to the waist of the skirt but one or two had colorful tunics that were worn over darker skirts. Some women had embroidered close-fitting vests. Men wore loose-fitting shirts, some white, some the conventional navy blue with the traditional double rows of brass buttons up the front. Many men sported a vest or suspenders. Dutch women had modest skirts, usually in somber colors. Some were gathered at the waist while some of the ankle-length ones had pleats. Men had dark, loose-fitting trousers that either came to their knees or their ankles. Long socks accompanied the shorter pants. In the province of Twente, the men donned wrist-length double-breasted black coats. Although town and city people wore European-style leather shoes, the rural folk put on the famous wooden shoes that they called “klompen,” which were also worn in many European countries such as Spain, Belgium and Germany. Traditionally hand-carved, plain and unpainted, they were perfect for the pervasive marshy lowlands that comprised the surrounding fields. Even today they are used by farmers and others who live in the rural wet areas. The secret to wearing the hard wooden klompen lies in the thick woolen socks that Dutch women know how to knit that keep feet warm, dry and free from chafing. The most visible accessory was the apron worn by most Dutch women. Whether short and flowered or floor-length and plain, in a subdued color or white, with or without lace, these items defined the Dutch woman and the province in which she lived. Some women carried knitted pouches at their waists, and some had short shawls that attached at the waist. In some provinces, both men and women wore suspenders. For the rich, diamonds, gold and silver jewelry had been available in Amsterdam since the 1500s. 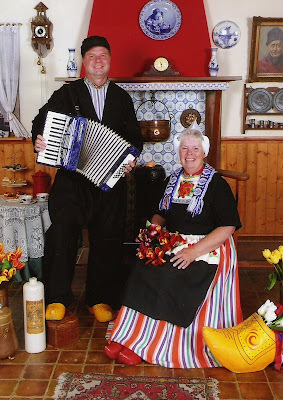 The most well known part of the traditional Dutch costume is the wooden clogs. Long ago, only very rich people could afford leather shoes, and so ordinary people wore shoes made of wood. The shape of the clogs was different according to what area of The Netherlands they came from. Today, some people working in the countryside still wear them occasionally, as they are cheaper and easier to wear than gumboots. However, most of the thousands of wooden clogs made today are sold to tourists wanting a souvenir of their trip to The Netherlands. A few people wear traditional costume regularly, but they are people working in places where tourists visit. Some old people can sometimes be seen wearing the traditional costume. On special occasions in country villages, such as weddings and fairs, some people wear traditional costumes.